I spent last weekend in Berlin, Germany, for a little vacation after a business trip in Europe. When I told my dad I was going to Berlin and asked him his thoughts, he told me the same thing he said before I went to Munich, all that comes to his mind is one thing—Nazis. It’s not like I don’t think about Nazis and the Holocaust as I walk the streets of Germany, but I’m generally able to compartmentalize those visions in order to appreciate the many good German people I’ve met and the enjoyable cultural experiences of the country. The following is a little peek into my Berlin experience last weekend—a pleasant, fascinating, enjoyable experience in a city that I would definitely visit again. After you read my piece, please read the one written by dad, giving his thoughts on my trip, that coincided with the 77th anniversary of Kristallnacht, the coordinated terrorism of Synagogues and property owned by Jews throughout Germany and Austria by Nazis on Nov. 9, 1938. My first impression of Berlin was its sheer vastness. Often to get from my hotel on the eastern edge of the city to a tourist destination or a night club it would take 25 to 40 minutes on an extensive public transit system. The city has a certain grittiness to it that reminds me of New York. It’s not that it’s dirty, but many of the buildings and the streets have a weatheredness to them. It’s also a hodgepodge of architecture, featuring some centuries old churches and historical buildings that survived the war’s bombings, along with buildings in what was formerly West Germany constructed after World War II in the ‘50s and ‘60s. In the section that was once East Germany, there are more modern buildings constructed after the city was unified following the end of the Cold War in 1989, as well as some buildings remaining that the Communist regime constructed. 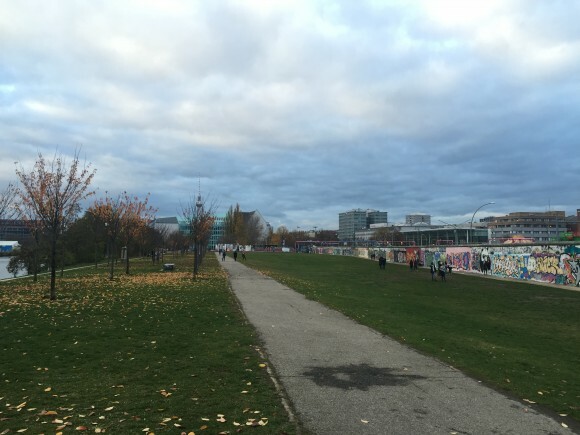 Much of the Berlin Wall still exists, running throughout the city, kept as a reminder of the brutal occupation by the Russians of East Germany for over 40 years. The wall was kind of beautiful to me as a tourist, colorful with graffiti over its entire length, its broken remains a symbol of freedom that overcame oppression. My understanding is that much of the wall was commissioned by the government to be painted by professional artists from around the world, although I saw sections that common local graffiti artists paint over every day. It seemed like many Berliners cleave to the wall as an important symbol of their identity. I was told on my tour that there is often an outcry when developers construct luxury buildings obscuring the Wall and the views of the other side of it. Berlin souvenir shops sell mocking replicas of the hats that the Soviet soldiers who once occupied the East wore, and t-shirts with illustrations of old cars breaking through the Wall. Monuments featuring the Soviet hammer and sickle symbol remain, protected in impeccably groomed parks, faithfully cared for by the city. On my three hour bike tour we visited some of those Communist monuments and learned about life in the once divided city, but we saw no monuments remembering the Holocaust. On my tour our guide never once mentioned the Holocaust. I know from reading TripAdvisor there are many spots throughout the city which pay homage to the horror of Nazi times, such as the Holocaust museum, but I covered a lot of ground around Berlin that weekend and did not bump into even one Holocaust reminder just by chance. That’s on the agenda for the next time there I guess. Berlin has a great down to earth vibe. The prices are surprisingly cheaper than most European cities I’ve visited or major U.S. cities like Chicago and New York. Dinner prices generally ran between 10 and 30 Euros, although usually I just ate Döner Kebab sandwiches for 5 or 6 Euros from one of the thousands of Turkish joints spread throughout in the city. When going to Berlin’s trendy dance clubs that it is famous for, its best to not wear fancy clothes or shoes. Before going out I read complaints online of people being rejected at clubs just for wearing button down shirts. I went to one of those trendy clubs on my first night in Berlin. I was on a train going to a Latin dance club (big surprise) when I met two Norwegian guys, Daniel and Nicolai. We struck up a conversation while they were messing with their iPhone app for train directions and they asked me if I wanted to go with them. Of course I said yes when Daniel told me that the club they were going to, named Sysiphus, was an old gutted out old high school in the middle of nowhere East Berlin. 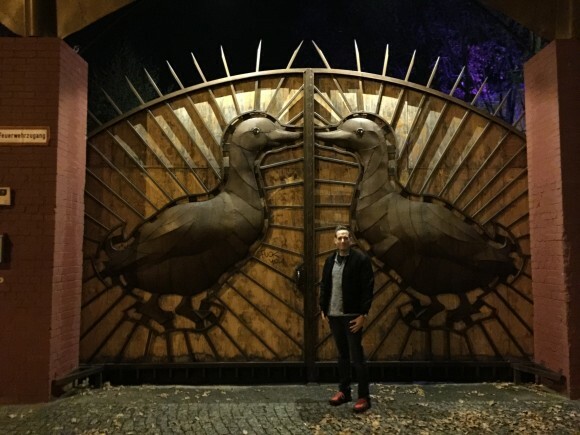 After getting off the train we walked a half a mile down a residential street until we saw a huge strange gate with large scary ducks illustrated on it. We arrived at the entrance around 1:00 a.m., a relatively early time for a club such as this on a Friday night. At clubs like Sisyphus many people arrive on Friday night and literally stay there partying all weekend, not leaving until Sunday morning. The bouncers made us put stickers on our phones’ camera lenses so we couldn’t take photos inside the club. The club had lots of eccentric decorations inside that would have made for some awesome photos. I guess they figured the mood would be spoiled if everyone was breaking out their cameras to record the decor, and I also think the camera ban added to the place’s mystique. In a huge dark room in the old high school building a few thousand people, intoxicated in a myriad of ways, swayed to house music spun by a DJ with spiked bleached hair, 5 to 10 piercings throughout his face, and a black sleeveless t-shirt—that’s what I remember at least, as I had no camera. Outside the high school was a large outside space perfect for milling around, meeting people and chilling out. I sat with my new Norwegian friends who were drinking and smoking on old ratty couches scattered about the common outside area. Sometimes we sat in a half destroyed cab of an old semi truck, also outfitted with old couches, as we tried to avoid getting wet by the light rain and ate surprisingly tasty vegetarian pizza and pumpkin soup. While we chilled out, soaking in the precious ambiance, my drunk Norwegian companions, one of whom was half Jewish, jokingly pondered what would happen if out of the blue one of us yelled “Hitler!” We were in a place filled predominantly with inebriated ravers in their early 20s. Would they be offended by such a gesture? One of the many strangers we struck up a conversation with at the club was a short German guy in his early 20s, who later informed us that he also had a Jewish father. We posed the question to him about what would happen if we yelled out “Hitler.” He laughed a bit anxiously and said that “Hitler” was the equivalent of the “N” word in Germany. You stay away from it, unless you want big trouble. What sort of trouble would ensue, we had no idea, but it was clear that the joke would not be well received. An American Jew, a German with a Jewish father, A Norwegian with a Jewish Mother, and a Christian Norwegian huddled together at a trendy alternative dance club at 2:00 a.m. discussing what would happen if we yelled “Hitler.” That’s what I saw in Berlin, Dad. Monday, November 9, was the 77th anniversary of Kristallnacht, the day that the Nazi extermination of Jews began in earnest in Germany. The irony of my son Noah cavorting in Berlin on the anniversary of that day that so many people I have known recall with abject horror, was not lost on me. When Noah told me he wanted to add on a couple days to his business trip to Europe to go to Berlin, I gasped silently to myself, “Of all places to go…” I thought of Adolph Hitler, goose stepping soldiers in parade uniforms, the burning synagogues and broken glass. Why Berlin? Any place but Berlin, the Führer’s capital. Noah is half my age. World War II and the Holocaust are “Schindler’s List” to him. I was born during that war. His grandparents suffered during that war. I have several friends whose families were gassed in German concentration camps and Noah wanted to party in Berlin on Kristallnacht. It wasn’t that I resented him having fun over the weekend, but the images from Leni Riefenstahl’s propaganda masterpieces made for the Third Reich and her Patron, Adolph Hilter, are the images I will carry in my bones, forever. I did not begrudge Noah joyfully taking a bike tour of the beautiful city where Jesse Owens showed up Hitler for America during the 1936 Olympics. The world has changed a lot since 1936. But the horror wrought by Hitler’s Germany endures for me. Am I happy Noah had a ball in Berlin a few days ago on the eve of Kristallnacht? Question: What do you think of when Germany is mentioned? Usually beer. I’m half German half Irish. I like beer. Another thought is: Engineering. Like the commercial says, German engineering. My father served in the Allied Occupation Forces in the USAAF in Germany circa 1945 and 1946. As an 18 year old American soldier he saw the destruction and deprivation of the people after the war, including working with many DP’s(displaced persons) who included European Jews who had survived the war and many immigrants fleeing the Russian Army. When I think of Germany I think of how far a people can fall in 15 years. I marvel how a hardworking and dedicated people can come back from such a defeated state, with help, and be strong economically and culturally once more. My father passed away in 1995. He said he thought he’d never live to see a united Germany, but he did. And he wondered what it would mean for the future. Great Soccer (football!) beautiful people; friendly, great food. Katarina Witt, Olympic park in Munich. Best brats in the whole universe, barbarian food, polka, orange Fanta and the list goes on and on. My mom used to say that you can dress up a monkey as much as you want but he is still a monkey. Let us all hope and pray that we never get to live through another Hitler. And lets us not forget that we have our own shady past when it comes to human rights (heck, still going on in Missouri, our borders and other places). So here is to the Germany that Noah saw and it may never again be the Germany that Lloyd so unfortunately lived. Berlin. It’s odd reading this piece as last night I just finished the book “Bonhoeffer: Pastor, Martyr, Prophet, Spy” Eric Metaxas, an excellent read by the way. Berlin and Germany have a different feeling now. They still mean Hitlers reign and a failure to understand the Nazi inhumanity madness to me, but I had no idea before the book that so many Germans were involved in the resistance and trying to assassinate Hitler. Many Germans were torn between nationalism, wounds from the Treaty of Versailles, a hatred of their leader and fear. Not an enviable position to be in. Germany still elicits very mixed feelings for me and a desire to understand its incomprehensible past. My wife is the child of a German national and a US soldier who was stationed in Berlin during the days when it was an occupied city. He was an investigator for the MP’s and she was his translator. When her father retired my wife (who was eight yrs old) spent two years living with her mother and grandparents in a small town in the German countryside. She loved her grandparents and by all accounts they were warm caring people. As my wife got older she began to ask questions of her mother “what did Grandpa and Grandma do when Hitler was in power?”. No one in the family wanted to talk about it. She knew her Grandfather had been an active Social Democrat before the Nazis (a liberal by our standards) but also a factory manager who kept his job throughout the rein of the Nazi’s rule. Apparently friends in the company moved him around quite a bit, and he may have joined the Nazi party at the end, simply to protect himself and his family. It is hard to believe there weren’t slave laborers in some of the factories he managed. Most Germans weren’t Schindler. During the eighties my wife and I owned a co-op apartment in the Bronx. Some of the residents of the building were survivors of the camps. I often saw the numbers tattooed on their arms. That is what I think of when Germany is mentioned. Some day I will visit Berlin. From Noah’s description it sounds like a great city. I will make it a point to visit the Holocaust Museum when I am there. I think you can’t understand Germans without thinking about the Holocaust. In retrospect I wish I got the Holocaust museum. It was hard to fit it into days. Sunday I went to the best Flea Market I’ve ever seen! You must go to the Mauerpark Flea Market. It goes all day on Sunday. There is a Holocaust memorial one square city block in size a couple of streets away from the Brandenburger Tor (Gate) consisting of 2711 concrete columns of various sizes. Put it on your list for your next visit. Both of my parents are German immigrants to the US although not Jewish. My father was age 12 and living in Berlin in 1945. This week he is attending, in Germany, a reunion of of men living in what he refers to as a “boarding House”…read orphanage. Both my parents have a story of survival both during and after the war. At the next Tech Conference or trade show, I would welcome the opportunity , over a beer of course, to learn more about your experience in Berlin. You are right. The Mauerpark Flea Market is a something to experience on a Sunday afternoon…..the food…the antiques and other wares for sale..the street performers and the mass of humanity. Cars and Beer. Not at the same time, of course…. Let’s first talk about Germany, then Missouri. I spent 11 days going all over Germany. I was very surprised by the unbelievable hospitality and of course the good beer. I don’t believe a good portion of the German people believed, or supported what Hitler did but they did not dare to speak up. They knew there was still space in Dachau for them. Had the end of WWI been handled differently there would never have been an environment that would have allowed a man like Hitler to exist and seize power. Now let’s talk about Missouri. If the reference about Missouri has to do with the recent events at the University I will address that. When you have 30,000 plus people in one school you will have people who hate. What happened there were isolated incidents of that and is not how the vast majority feel. If this were the case they would not have elected a gay black man as their student body president. This whole mess is typical of the news media turning a mole hill into a mountain. I had three sons go through there getting bachelors and masters degrees and they said that what was shown by the news media is not MIZZOU. Unfortunately most Germans did support Hitler. He was elected to office by a majority. Watch the newsreel footage from the day. There were broad swaths of the population who applauded the brown shirts attacking Jewish shops, schools and synagogues. Anti-Antisemitism has deep roots in Europe. The French and Polish at best stood by and many collaborated with the extermination. The Austrians turned out en mass to applaud Hitlers entrance into Vienna. Many (including my mother-in-laws family) were disturbed but they never spoke up, even in the early days before the Nazi’s were in power. Others wrote him off as an isolated extremist. The lesson I take from this is to be very careful about assuming that racist incidents are simply isolated cases, that most people have goodwill and would never support another of Hitlers ilk. The events in MIZZOU may be only an isolated case, however the gay black student body president you mention seemed to think otherwise. I saw him interviewed and he seemed like a quiet thoughtful character. A Germany tour with MBCA , the U.S. Mercedes club , to Stuttgart is a must to do. The Allies destroyed the factories but they came back strongly with our help. An industrial show in Munich also is a must. The site of the old airport. Enjoyed your article. I’ve been to a few cities in Germany, but not to Berlin. Dachau Prison Camp and the Normandy Beaches are haunting when you stand side by side with Germans. You wonder what they are thinking when they see these war sites. Did you have family members that fought? Even though my father fought in the Pacific, many of his friends fought in the European theatre. I’ve heard many of their tales. It will take many generations before these feelings fade. If you venture to Heidelberg or the Black Forest you can take in the beauty and free yourself from these thoughts of hatred and death. German is a lovely country and so clean. All countries have histories. We must learn from our mistakes. These comments make me feel good about the blog we do with our community. What I hope for in every piece is that we connect–the dots and the people. Whether it is baseball or robots or Berlin, if it connects, it works.